For most people, when you call examples of great writing to mind, most likely the first thing you think of is your favorite book. If you're the movie loving type, perhaps you think of an awesome piece of cinema that really got to you. But for one reason or another, most people probably don't think of video games. Unfortunately, there's still a decently sized contingent of people in the world that think games are for children and slackers. Not only is this a misconception (the age of the average gamer in the United States took a big drop this year—to thirty), but video games offer a unique method of storytelling that simply doesn't exist in other forms of art. How many books have you read that made you feel like the accomplishments and failings of the protagonist were yours? How many movies have you seen that let you shape the unfolding story with your own choices? The simple truth is that games have grown into an excellent medium for great stories, and the industry has become home to some awesome writers. 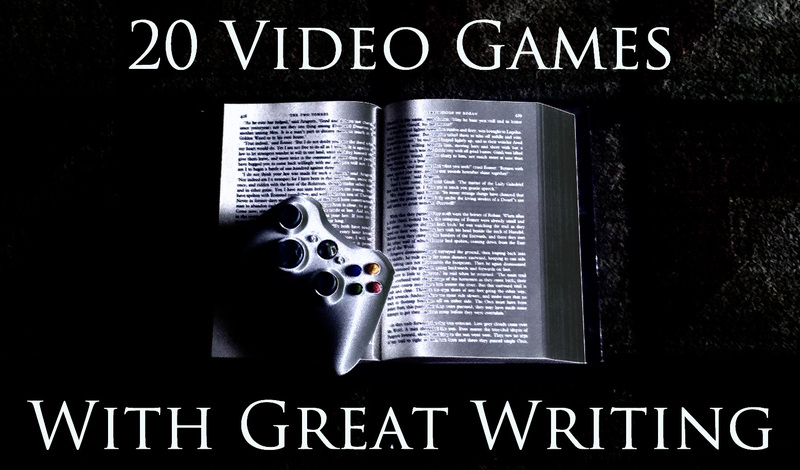 Last week, I kicked off the countdown of my twenty favorite examples of great writing in video games. Today, we make our way through the top ten. If you think games are for the artless and the immature, you may want to give these a try. They might just change your mind. Based on the Hugo Award winning Harlan Ellison short story of the same name, I Have No Mouth and I Must Scream is a 1995 point-and-click adventure game of post-apocalyptic psychological horror. Taking place a hundred years after the end of the world as we know it, players take control of the last five human beings on Earth, who are being tortured and toyed with by the supercomputer that orchestrated the apocalypse (voiced by Ellison himself). Though dark and at times gruesome, the writing has all the touches of the acclaimed author that co-designed it with The Dreamers Guild. You really don't see many games like this one anymore. In 2007, vaunted developer Naughty Dog chose to move away from the platform games they were known for with the release of Uncharted: Drake's Fortune. Not being a huge fan of third-person shooters, I was largely unimpressed when I first heard about the game. Then I played it and fell in love. The Uncharted series is the Indiana Jones reboot you never knew you needed. No game that I've played has done a better job at capturing sheer cinematic atmosphere. Every game in the series feels like an interactive action movie, and I'd match the story, characters, and dialogue against any summer blockbuster. Westerns have long been an elusive genre in the video game world. There have been many attempts over the years, some better than others, but for the longest time it felt like we never got that gunslinger we were waiting for. Then, in 2010, Red Dead Redemption came along. Published by Rockstar as the spiritual successor to an earlier attempt at the genre, Red Dead Redemption tells the story of John Marston, a reformed outlaw forced by the government to hunt down members of the gang he used to run with. With compelling characters, an emotional ending, and a thematic commentary on the end of the old west, RDR does nearly everything right. The Assassin's Creed franchise has become something of a Thanksgiving ritual in my household since its first release in November of 2007. Developed by Ubisoft, the series manages to reach my inner science-fiction nerd, fantasy geek, and history buff all in one fell swoop. Its story revolves around a clandestine power struggle that's lasted thousands of years, intertwined with world history. Players control Desmond Miles and his ancestors as he explores his genetic memory, mucking about Forrest Gump style in the Third Crusade, the Italian Renaissance, and the American Revolutionary War (though Gump never stabbed any major historical figures in the neck). First released by Lucasarts in 1990, the Monkey Island series is beloved of graphic adventure game fans everywhere. The third game in the series, The Curse of Monkey Island, may very well represent the pinnacle of comedic adventure games, in my humble opinion. Players accompany Guybrush Threepwood, Mighty Pirate™ during his continuous struggles against the dread (ghost zombie demon) pirate Lechuck. The series is filled with unforgettable characters, hilarious moments, and more quotable quips than you can shake a rubber-chicken-with-a-pulley-in-the-middle at. Go ahead. Say it. Last year, Bethesda released Skyrim, the much heralded fifth chapter of The Elder Scrolls. It shot to the top of the charts on consoles and PCs, becoming the fastest selling game in the history of Steam. Since the release of Arena in 1994, the series has grown quite the reputation, and an enormous part of its charm is the writing. Bethesda has crafted an enchanting world of epic fantasy, weaving the kind of stories you might expect to find in a novel. In fact, every book in the game is a readable text, filling players in on the history of Tamriel. Few games have presented this level of worldbuilding and attention to detail, and The Elder Scrolls shines as a result. I know what you're thinking. That's cheating, right? But the bottom line is that this list would be dominated by Bioware games if I gave each of them their own spot, and I wanted to let some other games shine in their own right. Since Baldur's Gate in 1998, Bioware has become an RPG powerhouse. Whether toiling on licensed properties like Neverwinter Nights and Knights of the Old Republic, or crafting worlds of their own design in games like Dragon Age and Mass Effect, Bioware is a company built on the backs of master storytellers. While the occasional hiccup may occur, you almost always know you're going to get great writing in a game with their logo on it. In 2007, Irrational Games introduced us to Rapture, the fathoms-deep laissez-faire dystopia at the heart of BioShock. A spiritual successor to System Shock, this RPG/Shooter hybrid received nearly universal acclaim. Players are cast into the role of Jack, who stumbles upon the entrance to Rapture after surviving a plane crash over the Atlantic ocean. Players learn the disconcerting history of the failed utopia as they explore its ruined remains and encounter what's left of its inhabitants. Inspired by Randian philosophy and the works of George Orwell and Aldous Huxley, BioShock is the kind of game that asks you to think about more than just which gun to fire. If this were a list of games that deserved more attention from consumers when they were released, Planescape: Torment may very well have been one spot higher. Released by Black Isle Studios in 1999, Planescape was notable for focusing on story above all else, putting hack n' slash combat on the back burner in favor of an estimated 800,000 word narrative. Players become The Nameless One, an immortal character with no memory, forced to piece together the events of past lives in an effort to break the curse he is plagued with. One of the first RPGs to challenge traditional moral conventions, Planescape: Torment is one of a kind. And that's a shame. In 2007, Valve Corporation released a discount bundle package for game consoles and PCs called The Orange Box. The centerpiece of the bundle was a new installment in its flagship franchise, Half-Life 2: Episode Two, which they were counting on to carry sales. However, they also included an unassuming title originally based on the senior class project from a group of students at DigiPen (who Valve hired right after graduation) called Portal. Minds were subsequently blown, and that surprising little game went on to win several game of the year awards, despite its short length and lack of hype prior to release. Portal has a very long list of good things going for it, including an innovative form of gameplay that mixes elements of the adventure, puzzle, and first-person action genres. This perfect blend undoubtedly helped in its attainment of left-field success, but its most charming quality was the fantastic writing. Players find themselves behind the eyes of Chell, an unfortunate test subject who wakes up in the Aperture Science research labs. She is greeted by GLaDOS, the artificial intelligence in control of the facility, who forces her to undergo experiments to test Aperture's new handheld portal device. And its this menacing AI that steals the show and wins the hearts of just about anyone that plays this game. Chell is a silent protagonist, so there is technically no dialogue in the game (in the strict sense of the word). However, that doesn't stop GLaDOS from making her presence known at all times, delivering instructions at the start of each test with some of the most cleverly written lines in the history of video games. And who can forget that performance at the end? In 2011, after much clamoring and slavering from fans, Valve finally released Portal 2. The sequel not only met fan and critic expectations, it exceeded them by a mile, adding new elements to the gameplay, multiplayer modes, and of course, a compelling story. The writing in Portal 2 was even better than its predecessor, widely expanding the lore of Aperture Science and its strange history. It added memorable new characters and heaps more of the same hilarious charm fans fell in love with in the first game. In my humble opinion, Portal 2 is the absolute best example of excellent writing in video games to date, with the first game right behind it. And so, the Portal series gets the number one crown in my countdown. If you haven't played those two games and you have even the smallest, most remote desire to engage in video gamedom at some point in your life, please do. You will thank me for it. So there you have it. Alas, I am but a man, and I can not possibly have played every great game ever made. So, if you think I missed something or you disagree with the way I have things ranked, by all means leave a comment and let me know. Planescape had a great storyline. It's one of my favorite games ever. I really wish someone would take up the reigns and do a game like that again. In this day and age of crowdsourced funding, it might be more possible than ever. I've just read "I Have No Mouth, And I Must Scream" this weekend, and absolutely loved it! I know that says a bit too much about just how sick my creative mind is, but that story was awesome. Imagine how my heart jumped when I started reading your post and it began with it. :D Unfortunately, the game doesn't seem to do it enough justice, IMO. I can add another game of that type (the good ol' type) which is very rich in story and creepiness, and which I loved playing in high-scool: Sanitarium. Amazing game that was! I'm just replaying Uncharted for the third time, all 3 games in a row, because it's one of the best adventure games I've ever played. Pure fun! I agree, the game version of I Have No Mouth and I Must Scream doesn't quite live up to the story itself, mostly because of the production values of the time (for instance, while it was kind of neat to have Harlan Ellison voice AM, he's not exactly the best voice actor in the world). Still, it has a special place in my heart for taking the chances it did. I haven't played Sanitarium; somehow I missed that one when the point-and-click genre was still thriving. I'll have to see if I can get my hands on it one of these days (and get it running on a modern machine). I agree with you on Assassin's Creed as well. While I didn't mind the idea of upgrading your arsenal and helping to revive the city, I definitely think they put too much of an emphasis on it. Revelations was my least favorite game in the series because I felt like they really pulled the focus away from the awesome story (especially in the Desmond sections *shivers*). I'm pumped for AC3 though, especially since the core team from AC2 is back in the saddle for this one. I'll admit I'm torn on the setting though. As much as the history nerd in me is excited to see it take place during the American Revolution, one of my favorite parts of the series is exploring the epic historical architecture of the setting, and Colonial America didn't have too much going for it in that regard. Excited though! Hope you enjoy Mass Effect and Portal! Doing this article has made me want to give the Portal games a replay. Thanks for the comment, Vero! Sanitarium is totally worth your time, promise. Also, OMFG I totally loved Desmond's journey in Revelations! One of the coolest bits of gameplay ever!! Wish they did an entire game like that! You mean the first person segments? Yeah, I'm with you there. Alot of people complained about them, but I really enjoyed those little bits of gameplay and finding more out about Desmond's past. 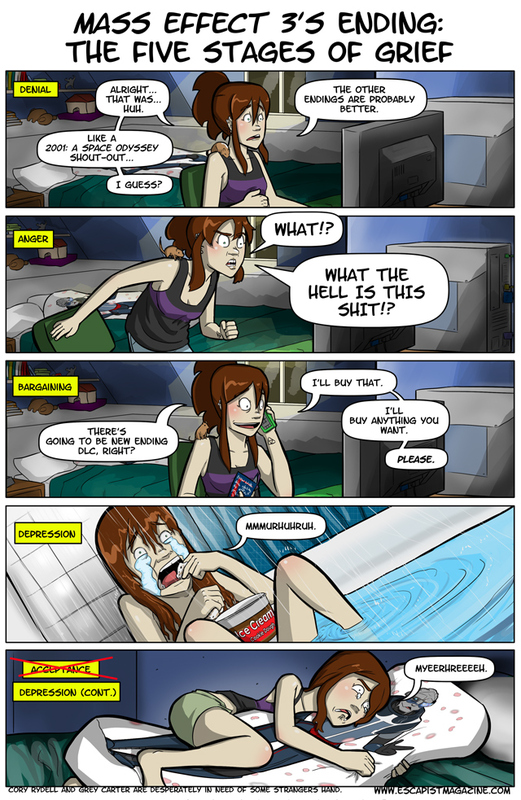 Overall though, I thought the whole "trapped in the animus" thing was lame. I was wanting more progression of Desmond's story than we got (I felt really cheated that the cliffhanger ending of Brotherhood was just kind of glossed over). I wonder if there will be a "Desmond only" series at some point? They do seem to be bringing him to a slow boil. . . I need to look into Uncharted. I've been meaning to do that. I'm really excited about next year's games, like Bioshock Infinite and The Last of Us. Those games look to be a blend of great storytelling and advancement in gaming tech like we've never seen before. 2013 should be an amazing year for video games! I'm with you on those two games, especially The Last of Us. The E3 footage this year was amazing. Can't wait to play them. Watch Dogs looks to be another great cinematic action game coming next year as well. You're right, 2013 will be awesome. The best years always seem to be the ones toward the end of console lifespans. I can't say I blame you on the EA thing. Lots of people are in that boat. I was disappointed when Bioware joined their fold, but I just don't have the willpower to stay away from a great game, even if it's got a lame publisher. It's amazing how so many people think A-Creed is just a 'stab em up' kind of game, but if you pay attention the writing really is quite spectacular. Glad FF received an honorable mention! FF7 was such a great game (but I spent have the game decking out Aerith and when she died I almost threw my PS out the window...) I love the writing... Although...their last few games have been killing me! Who fired the main writer and when's he/she coming back!? Yep, it's some of those recent questionable games that held the Final Fantasy series off of the main list, unfortunately. But I agree, some of the earlier games in the series are some of the greatest of all time. FFVI and VII will always be in my top 5 for JRPGs! I loved the Monkey Island series. I laughed my head off at the sword fight. Excellent post J.W. Monkey Island will always be one of my favorite series. I replay them regularly. I wish Lucasarts would rerelease Curse of Monkey Island like they did for the first two games. These sound really interesting. I am not really into video games, but I'm planning to look into them more. You might be surprised how much you enjoy them! Thanks for stopping by, Gina. I was waiting for a mention of at least one of the Bioware games! I'm working my way through the list - once I get started on one of their games, it's hard to want to do anything else! I never played Monkey Island, but I will always love LucasArts for "Day of the Tentacle". I think it's fair to say that a lot of games I played in the 90s shaped how I write today. Day of the Tentacle is another all-time classic. Love that game! It's a real shame that LucasArts stopped making those old school adventure games. They pretty much just crank out Star Wars stuff now. Get on it. A slightly old RPG but one that is a classic. If you think Skyrim or even Assassin's Creed had great storylines, you clearly have never played this game. It is one of the greatest games ever created, and it was such a disappointment the company went under before the creators could work out every bug. But most of those can be fixed with the community patches you can find online. It seems you didn't read the first half of the list, anon! Bloodlines was the first game I mentioned. It's one of my favorite RPGs of all time. I have to say, I've been playing Uncharted (for the first time) and I am in love with it!! If I had written this, though, I would have added the Jak and Daxter series (mainly for the sequels, not the original one) and the Kingdom Hearts series. Kingdom Hearts inspired me to become a video game writer in the first place. That honestly would have been my number one. Ah, I must confess I never played either of those series. I stayed away from Jak and Daxter primarily because I have trouble getting into platformers. I know the series ultimately became bigger than its platformer roots, but I never did end up checking it out. And Kingdom Hearts came around at a time when I'd begun to drift away from JRPGs and was discovering all of the western RPGs I'd missed while obsessed with Final Fantasy and the like. I very well may pick up the HD rerelease one of these days.